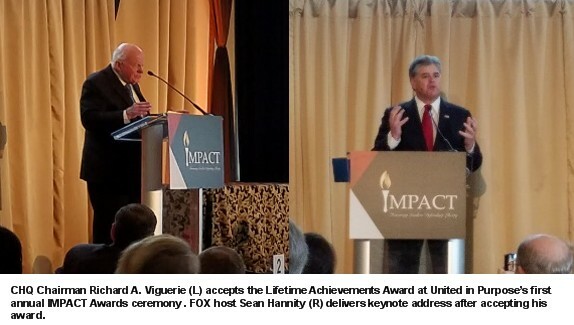 On Wednesday, December 6, 2016 CHQ Chairman Richard A Viguerie joined Sean Hannity and leaders of the conservative movement from across the country at the first annual United in Purpose IMPACT awards honoring leaders defending liberty. To watch the awards program, including FOX News superstar Sean Hannitty's keynote address please click this link. I’m honored and humbled by this award. A few years ago, I got two lifetime awards within a few hours and I asked the hosts if there was something I should know – had they talked to my doctor? You too can be up here one day; just outlive everybody else. I’m 84 years old I go 13 to 14 hours a day, five and a half days a week – love every minute of it. I’ve been blessed so much by the Lord; my role model is Moses. Some of you have heard me say this before: Chapter 34, verse 7 Deuteronomy – “…and Moses lived to be 120 and his eye was not dimmed, nor his vital forces abated…”. Moses lived his life in three 40-year compartments: 40 years in the house of the Pharaoh, 40 years in the wilderness with his family and 40 years leading the Israelites. So, I tell my liberal friends look out liberals at 84 Viguerie is just getting started. Obviously, anything I’ve achieved is a large team event. I start with my company American Target Advertising, where we’ve had hundreds of high level marketing men and women work for us over the years. We have two of them here today: Kathleen Patton our CEO and George Rasley, Editor of ConservativeHQ.com and we’ve just been blessed with so many good people. I’m fortunate to have my son Ryan with me today – a Hillsdale College graduate – sitting with Dr. Arn – which is kind of special. The other thing is all of you. I’ve worked with many of you over 20 – 30 – 40 years, so anything I’m awarded here is shared by all of you. And I’d be derelict if I didn’t say many of those who I worked with over the years are no longer with us, and I’ve just been pleased and fortunate to work with people like Paul Weyrich, and Howard Phillips, And Terry Dolan, and Jesse Helms, and Phyllis Schlafly, and Jerry Falwell… and I could just go on and on about the giants who are no longer with us whose shoulders we stand on. And by the way there are a lot of young people here and you might have the feeling that the conservative movement started maybe with the Tea Party, or maybe with the Gingrich Revolution in 1994, or if that’s not true then surely it started in 1980 with the Reagan Revolution and our guest Ed Meese here – NO, not so, not even in 1964 with Goldwater. We all stand on the shoulders of giants who began our movement in the late 40s to 50s – Russell Kirk, Bill Buckley, Brent Bozell, Frank Meyer, Frank Hannigan, Henry Regnery – the list just goes on and on – the giants whose shoulders we all stand on. They were first generation conservatives, I’m a second-generation conservative; we’re now probably in the fourth generation now, and there’s now a lot more of the fourth generation than there were of the first, second or even third generations. Now one thing that bonded the second generation is that we were 100 percent – almost everybody – before we were conservatives we were anti-communists. And that’s what brought us into the movement – and we were also entrepreneurs. And many, many of today’s conservative organizations – still going strong – were founded by second generation conservatives. So, one of the things that I say to conservatives regularly is we have a fraction of the organizations that the Left has. They have thousands and thousands of race-based organizations, anti-family organizations, environmental organizations, and we need many, many more organizations to help us; so the water’s fine out there young conservative entrepreneurs – jump in. Another thing I want to share is read: Read, read, study your history. There are lots of good books about conservatism out there. In the last few months three wonderful books about the conservative movement have been written. Arnie Steinberg wrote one, Dr. Lee Edwards wrote one and Neal Freeman, and there are many, many more good conservative books out there showing how we got to where we are now. And so, you need to know your history to make the best contribution going forward. Last comment – it is easy these days to be discouraged. I was saying last night to a group of you here – I was there for the Goldwater debacle in 1964. There was a darkness about the conservative landscape that was of Biblical proportions, and it didn’t get any better throughout the 1960s and 70s. In 1974 Nixon resigns and Jerry Ford is President. He goes before the Democrat-controlled Congress and says, I come here tonight under the banner of four Cs; consensus, compromise, conciliation, and cooperation… in other words – I surrender, whatever you want, I’ll do it. And of course, in 1976 Ronald Reagan had lost the Republican nomination battle – it was close – but he still lost it, but anyway, it was really, really dark times there. We didn’t have Hannity, Levin, Rush, we didn’t have FOX or the internet, and we didn’t have all the organizations like Tom Fitton at Judicial Watch, and Leonard Leo and the Federalist Society, and all of these wonderful organizations – they didn’t exist then. So be of good faith, and be of good cheer, because I think we are winning, so keep the faith – trust God and walk with God and we’re going to win. Two days after the election last November about a dozen or so of us were gathered at the Heritage Foundation to continue the vast rightwing conspiracy and my friend Bob McEwen was there and he says these wonderful words, “If you can’t see the hand of God in this election, then you are deaf, dumb and blind.” Thank you.